William Hamilton Rules his Newspaper "With a Pen Steeped in Gall"
ANCASTER'S early newspaper publishers were a colorful crew of printers who were blessed with (and cursed with) powerful and dramatic personalities. William Hamilton included. William's life is the story of a printer's apprentice who rises through the ranks to become one of Pennsylvania's most powerful newspaper publishers ...and then falls from grace into bankruptcy to end his days "insane" in the local poorhouse. William Hamilton learned to print and publish newspapers in Philadephia, where he was an apprentice in the print shop of Benjamin Franklin's grandson, Benjamin Franklin Bache. 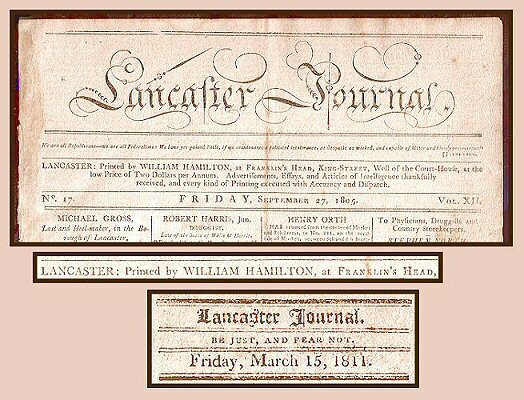 In 1794 Hamilton co-founded the newspaper Lancaster Journal, with Henry Willcocks. This newspaper was a forerunner of today's Intelligencer Journal. Hamilton turned this newspaper into Lancaster's most influential Federalist newspaper, although to do this he had to change his political party, and flip-flop his newspaper out of the anti-Federalist camp. Hamilton's Lancaster Journal was often a showcase of partisan politics. Hamilton wrote his Lancaster Journal's aggressive commentaries "with a pen steeped in gall" (my favorite Henry Long quote about Hamilton). Hamilton's style may have been abrasive, but his forceful editorializing helped spur on local participation in voting and civic involvement to levels never before seen in Lancaster. William Hamilton Says: Don't Vote for Simon Snyder. He's a Lousy Speller, and will be a Lousy Governor. William Hamilton was no cloistered saint. His politics was fickle, and his Lancaster Journal was equally so. Hamilton had flip-flopped his Lancster Journal's political allegiance from the anti-Federalists to the Federalists, after being attacked in print by Federalists Robert Coleman and Charles Smith. Although Hamilton had supported Thomas Jefferson's anti-Federalist party in the 1796 presidential election, within 3 years Hamilton's newspaper reversed course and was a card-carrying Federalist. In a March 1805 Lancaster Journal Hamilton used his barbed pen to attack the campaign of Simon Snyder for Pennsylvania governor. Hamilton argued that Simon Snyder was a bad speller, so that meant he would also be a bad governor. 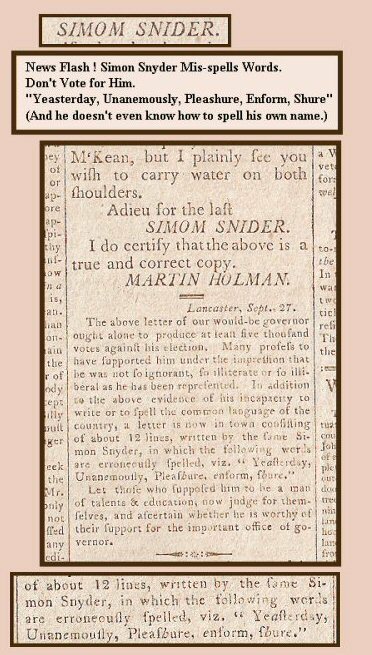 In the same column, Hamilton caricatured Snyder's spelling ability, by mis-spelling Snyder's name as "Simom Snider." 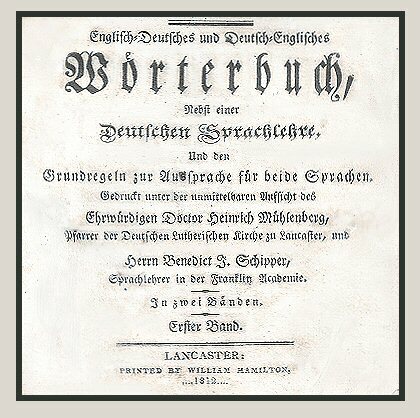 Snyder (born into a Lancaster Moravian family) eventually became the first Pennsylvania German governor of Pennsylvania. Despite William Hamilton's hard-core flaws, I tend to give him the benefit of the doubt. American politics was young. It was a new country and a new system. American politicians and their publishers were playing it by ear. Learning from their mistakes. Politicos were supposed to act sophomoric. P.S. William Hamilton went on to become a state senator and treasurer of Lancaster County. But within two years he was bankrupt and alone. He died at age 49, "insane" in the Lancaster poorhouse. But he has become one of my favorite Lancaster publishers, warts and all. Above and Below: The dictionary's title page is printed in both English and German. ILLIAM HAMILTON'S greatest claim to fame in the world of academia and science results from his association with Lancaster's best-known educator / pastor / botanist / Renaissance Man: Henry Muhlenberg (Rev. Gotthilf Heinrich Ernst Muhlenberg). In the 1780s, Muhlenberg became pastor of Trinity Lutheran Church and the first principal of Franklin College, the school that would become Franklin and Marshall College. In a very-busy, two-year marathon of printing, William Hamilton printed two of Muhlenberg's greatest works, Muhlenberg's 1812 dictionary and his 1813 study of American botany, Catalogus plantarum Americæ Septentrionalis. Meanwhile, as if he wasn't busy enough, Hamilton spent three months on a military campaign in Baltimore, to defend the city from the British during the War of 1812. He obviously had competent help back home who could run the print shop without him. 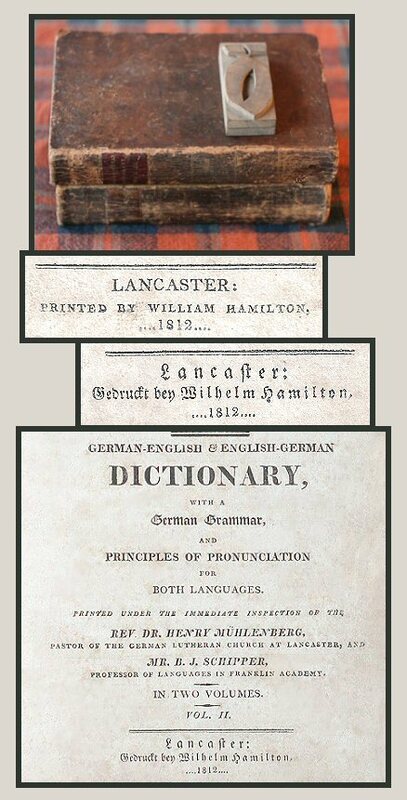 This 1812 dictionary is the first German-English dictionary printed in America. 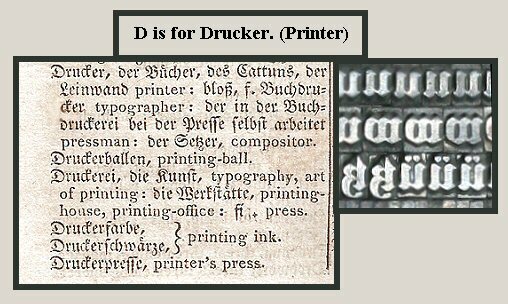 In 1904 Frank Diffenderffer labelled this dictionary "the most important work from a typographical standpoint that had so far made its appearance from the Lancaster printers." ...referring to the variety of Roman and fraktur fonts used in this uniquely-important book. William Hamilton's book-and-broadside printing business eventually evolved into today's Intelligencer Printing Company.